This image, transmitted to Earth from the Hubble Space Telescope, depicts “Gas Pillars in the Eagle Nebula (M16): Pillars of Creation in a Star-Forming Region.” Image credit: NASA, ESA, STScI, J. Hester and P. Scowen (Arizona State University). Why are Hubble's pictures of nebulae (from the Latin word for “clouds”) so stunning? In a way, they remind us of sunsets with clouds. Although beautiful when the sky is clear, sunsets tend to be significantly more awe-inspiring in the presence of clouds. Nebulae - glowing shells of dust, gas and plasma (not the kind that’s in your blood) - are sometimes like wispy or billowing clouds reflecting the sun’s light. 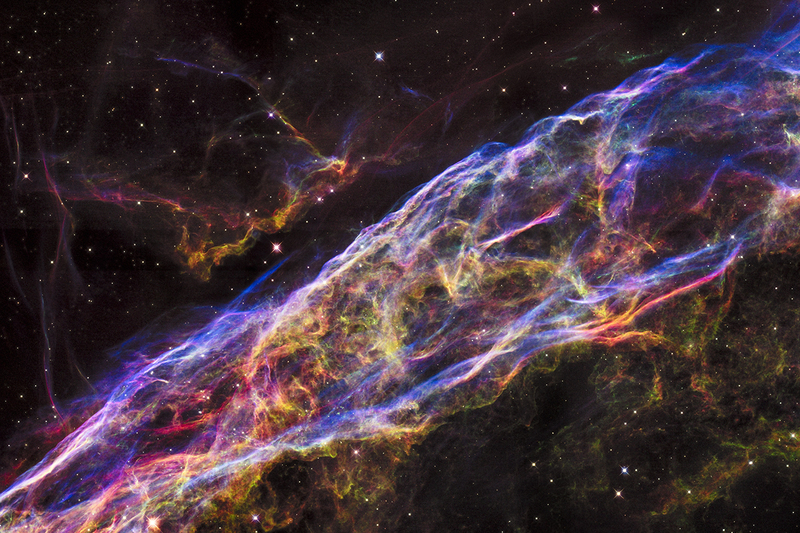 A particularly beautiful one is the Veil Nebula which is so huge it measures about 110 light-years across. Images recorded by orbiting space telescopes allow us to examine these swaths of interstellar dust and gas, illuminated by their interaction with nearby stars (or their own star remnants). There are four types of nebulae: absorption, emission, planetary and reflection. With pictures from the space telescopes, we can examine some of each. Absorption Nebulae look like dense clouds. Because they absorb light from behind, they appear darker than their surroundings. The most notable example is the Horsehead. Emission Nebulae appear to be swirling masses of glowing, wispy clouds. A nearby energy source - frequently a hot star - causes those clouds (composed of interstellar gases) to glow. The Bubble Nebula, located in the constellation Cassiopeia, is lit by a central star. The Carina Nebula - depicted in this panoramic image by a mosaic of forty-eight frames recorded by Hubble - looks like it could have been a backdrop for Michelangelo’s Sistine-Chapel paintings. Some of the color we see in Hubble’s image of the Trifid Nebula is glowing hydrogen. Planetary Nebulae are not planets. Astronomers use that word to simply describe their general appearance, especially when they are seen through small telescopes. Notable examples are the Helix, Cat’s Eye, the Eskimo, NGC 3132 (also known as “Eight Burst” or “Southern Ring”) and the "glowing eye” of NGC 6751. Reflection Nebulae, like fog around a street lamp, have no light of their own. NGC 1999 (which is “near” the famous Orion Nebula) is illuminated by a star known as V380 Orionis while IC 349 is lit by Merope, the bright Pleiades star. Now that we know something about nebulae, let’s compare them with the objects first attracting Charles Messier’s attention: Comets. Bos, Carole "NOTABLE NEBULAE" AwesomeStories.com. Jun 01, 2008. Apr 23, 2019.